It was such a thrill to finally visit the wonderful remains of this early christian monastery. The name is derived from Inis meaning Island and Cealtair in old Irish meaning Church. Church Island was later known locally as Holy Island. A monastery was first established here by St Colum around 520 CE. St Colman is also referred to as St Colum of Terryglass as he also found a monastery at Terryglass in County Tipperary. The next few pages will take you on our journey around the island starting with the most prominent remains the Round Tower. 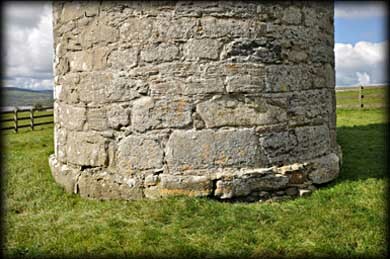 Standing at about 22.3 metres in height the 11/12th century round tower is clearly visible as you approach the island. The most obvious thing you notice about the tower is the conical cap is missing. There is a theory that the tower was never finished and during excavations by Doctor Liam De Paor in the 1970s no stones that may have formed a cap were ever found. There are a total of four windows in the drum. The only other opening is the round headed doorway, pictured above. In the image below you can see the offset that was revealed during the excavations and restoration in the 70s. To the east of the tower is St Caimin's Church. 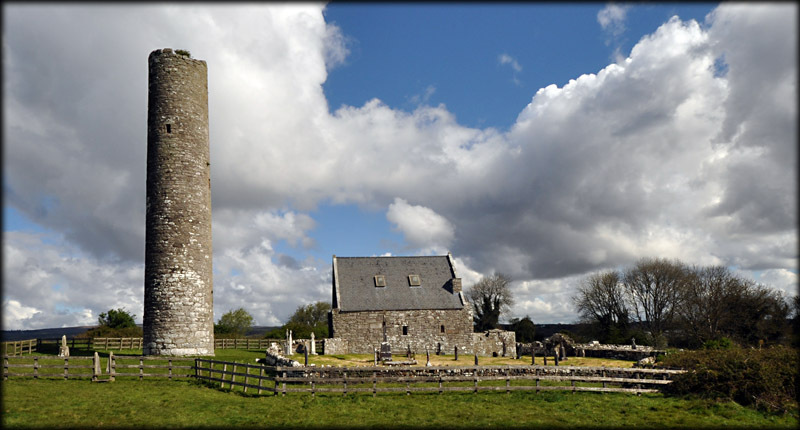 Situated: The Round Tower is located at the monastic site on Holy Island - Inis cealtra on Lough Derg, County Clare. Ger Madden runs boat trips to the Island from Mountshannon Pier in County Clare. Discovery Map 58: R 6982 8504. Last visit April 2012. Door: Above ground 3.3m. Type: Arched. Windows: Four. 3 small lintelled. 1 large angled window. Features: Second storey, traditionally the Treasury, has a stone floor and a large angled window.